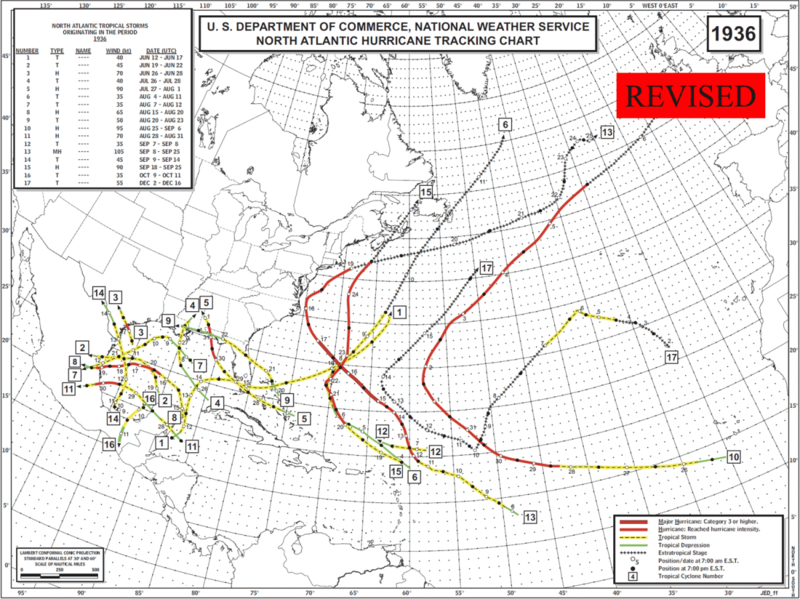 A previous blog entry described the new NHC five-day tropical cyclone formation (or genesis) products. In this blog entry, we discuss the factors that go into these predictions. The primary tool used at NHC for five-day tropical cyclone genesis forecasts is global numerical modeling. Global models can predict many of the environmental factors that influence tropical cyclone formation, and the skill of these models has been improving with time. More tropical cyclone formations are being forecast with longer lead times, and weather prediction models show fewer “false alarms” than in the past. Recent studies suggest, and forecaster experience seems to confirm, that a consensus of the available model guidance usually outperforms any single model. This “two heads are better than one” approach works as long as the models (or heads) are somewhat independent of one another. 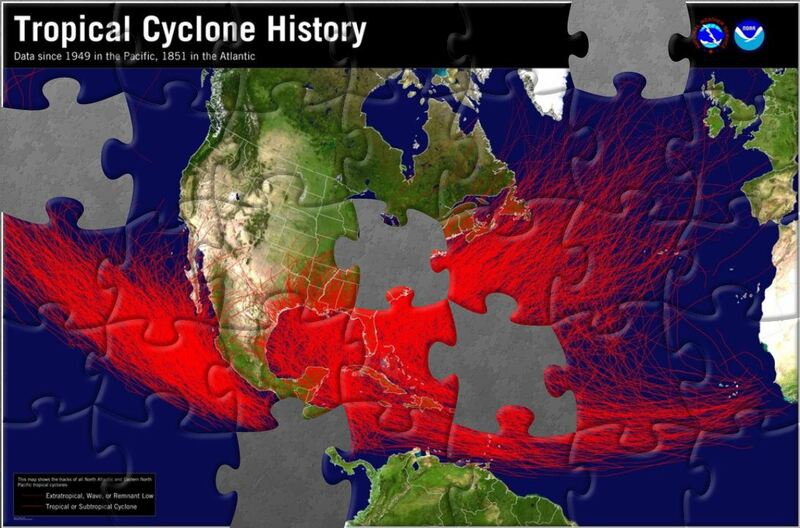 In addition, NHC is currently evaluating a few statistical techniques that use the global model output to produce objective guidance designed to assist hurricane specialists in developing the probabilities of formation issued in the Tropical Weather Outlook. Global model guidance is not the only tool available to NHC forecasters, however. 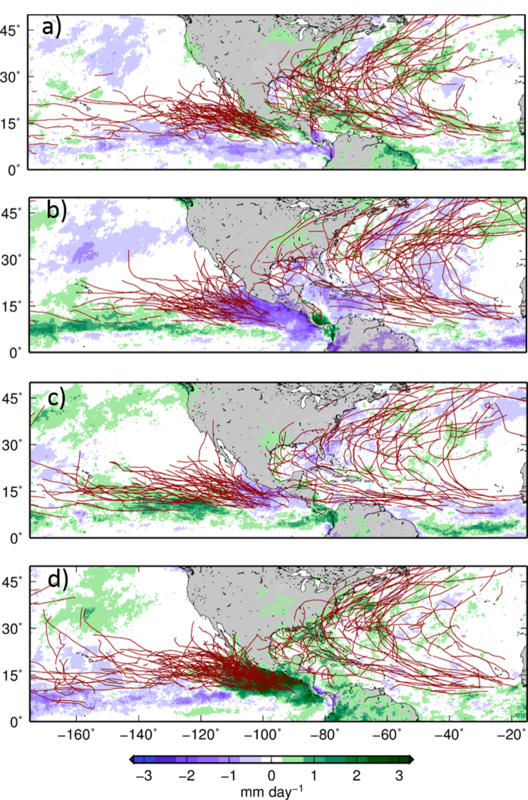 Researchers have learned that a majority of lower latitude tropical cyclone formations are associated with waves in the atmosphere moving through the global Tropics from west to east. Two particularly important wave types are the Convectively Coupled Kelvin Wave (CCKW), which circumnavigates the equator in about 15 to 20 days, and the Madden-Julian Oscillation (MJO), which transits the globe in 30 to 60 days. These waves are normally initiated by large areas of thunderstorm activity over tropical regions, especially near India and southeastern Asia. These waves are different in both frequency and direction of motion from the more well-known tropical waves that originate over Africa and often spawn tropical cyclones as they move westward across the Atlantic and eastern North Pacific basins. Tropical cyclone formation often accompanies the passage of the “active phase” of either the faster-moving CCKWs or the slower-moving MJO. Figure 1 shows tropical cyclone tracks over a 37-year period in active and inactive phases of the MJO as the wave moves around the globe, along with increased or decreased rainfall anomalies associated with the two phases of the MJO (Zhang 2013). In the figure, the active phase of the MJO for the Atlantic occurs in panel (a), while for the eastern Pacific the active phase occurs in panel (d). The less active phases for these two basins fall in panels (c) and (b), respectively. 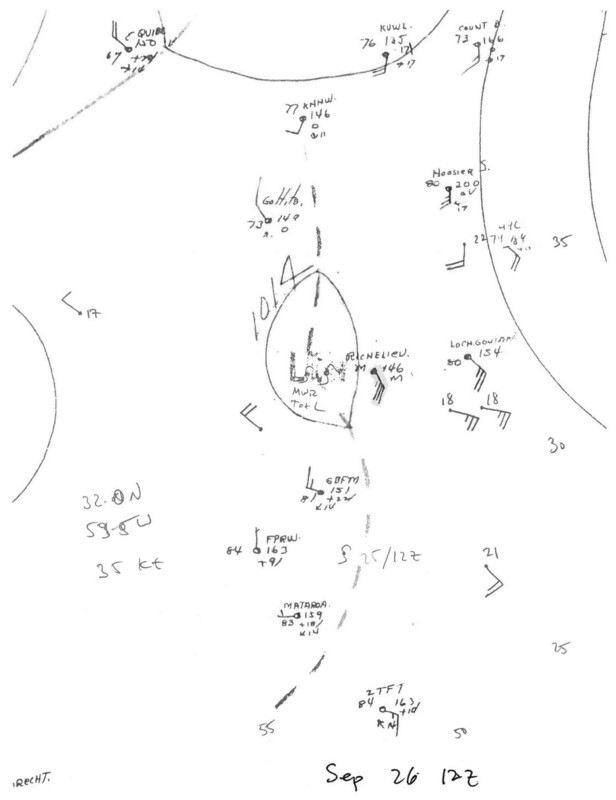 Figure 1. Tropical cyclone tracks in active and inactive phases of the MJO and increased (green) and decreased (purple) rainfall anomalies associated with the two phases of the MJO (from Zhang 2013). 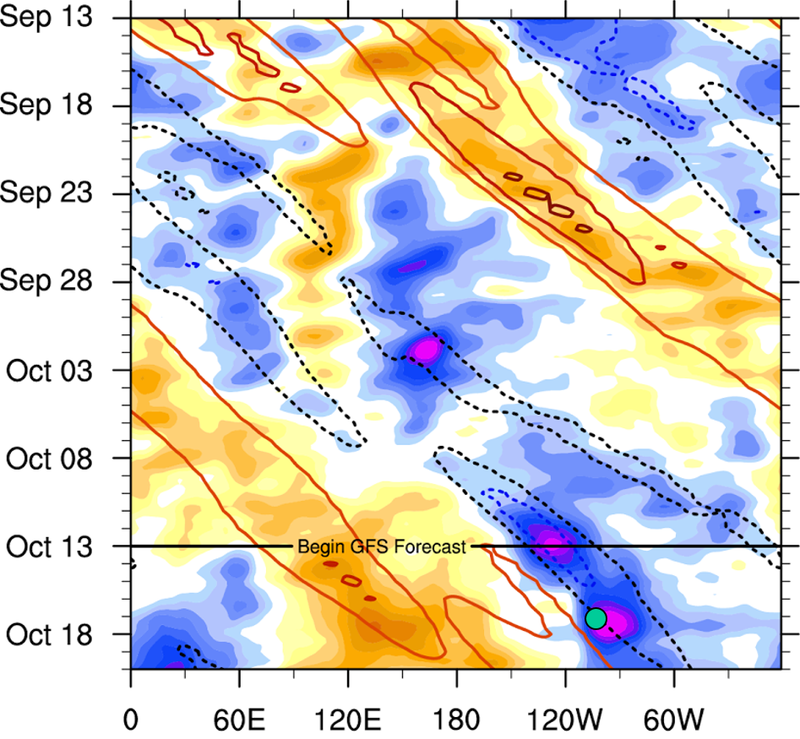 Panel (a) shows the active phase of the MJO for the Atlantic, and (d) shows the active phase for the eastern Pacific. Panels (b) and (c) show the less active phases for both basins. This concentration of tropical cyclone activity occurs because each type of wave temporarily makes large-scale environmental conditions, such as vertical wind shear or atmospheric moisture, more conducive for tropical cyclone formation. Although not every wave causes a tropical cyclone to form, pre-existing disturbances have a greater likelihood of developing into tropical cyclones after the passage of a CCKW or the MJO. High-activity periods can last as long as a week or more with the MJO, but are generally followed by days to possibly weeks of little to no activity during the inactive phases of these waves, when large-scale conditions become unfavorable for tropical cyclone formation. Forecasters use real-time atmospheric data and other tools to diagnose the location and motion of these important catalysts for tropical cyclone formation. Here is an example from the 2014 hurricane season of how forecasters used these atmospheric signals. The graphic below, called a Hovmöeller diagram, shows where large areas of rising air (cool colors) and sinking air (warm colors) exist near the equator as a function of time. The dashed black contours depict the active phase of successive CCKWs, and the solid red contours show the inactive phases. In this particular case, forecasters noted that there was a strong CCKW moving through the eastern Pacific in the middle part of October. Extrapolating the wave forward in time, along with numerical models forecasts of the wave’s location and strength, suggested that a tropical cyclone could form within a few days over the far eastern Pacific from a disturbance that was already in the area. The green dot indicates where Tropical Storm Trudy formed, a day or two after the CCKW passed the disturbance. 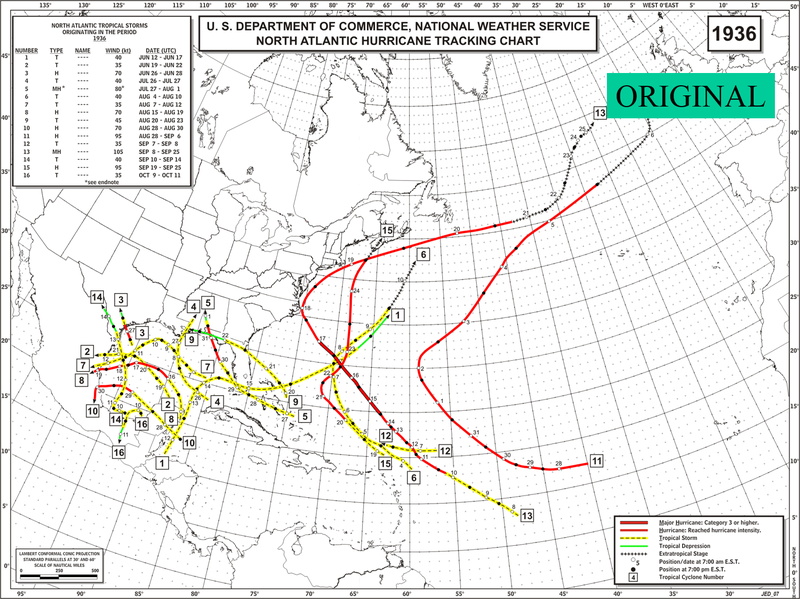 Although CCKW tracking is only a secondary factor in determining a Tropical Weather Outlook forecast, a basic knowledge of this atmospheric phenomenon is an important part of the process. Forecasters consider many factors when preparing the five-day genesis probabilities for the Tropical Weather Outlook, including explicit forecasts from the global models and knowledge of any ongoing CCKWs or the MJO. In addition, the final NHC forecast also reflects the current trends of the disturbance, which are weighted much more heavily in the two-day outlook, but also can affect the five-day forecast as well. There are several ongoing research projects that will hopefully yield objective probabilities and other tools designed to help better predict tropical cyclone formation. These tools, in combination with the dynamical guidance from numerical models, should improve the quality of genesis forecasts and perhaps in the next five years extend reliable tropical cyclone formation forecasts from five days to one week. Zhang, Chidong 2013: Madden–Julian Oscillation: Bridging Weather and Climate. Bull. Amer. Meteor. Soc., 94, 1849–1870. Thanks to Chidong Zhang and David Zermeno, University of Miami RSMAS, for Figure 1. This entry was posted in Forecasting, Genesis, NHC and tagged genesis, Kelvin wave, MJO.